Humans. 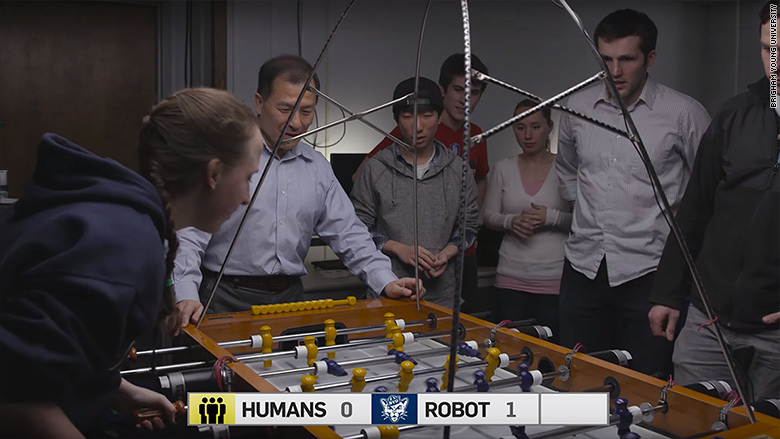 vs. robots: Who wins at foosball? Computers have been beating humans at board games like chess and Go. But now they've conquered the basement and bar game of foosball too. 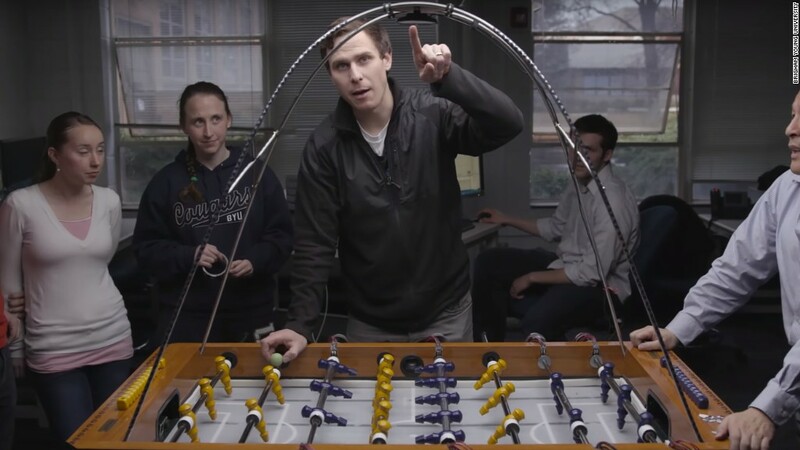 A group of undergrads at Brigham Young University in Utah have built an AI machine that can play on a modified foosball table. In a recent game, the machine defeated a human player four to one. 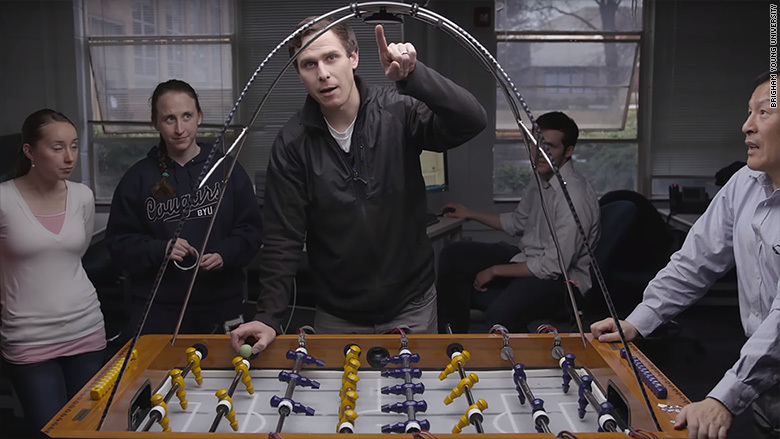 "It's not that we need a computerized foosball table, but it is a small example of a much larger problem," computer engineering student Nathan Warner said in a video. In the future, computers will have to react to physical surroundings in more nuanced ways. They'll be inside of things like self-driving cars and robotic assistants. 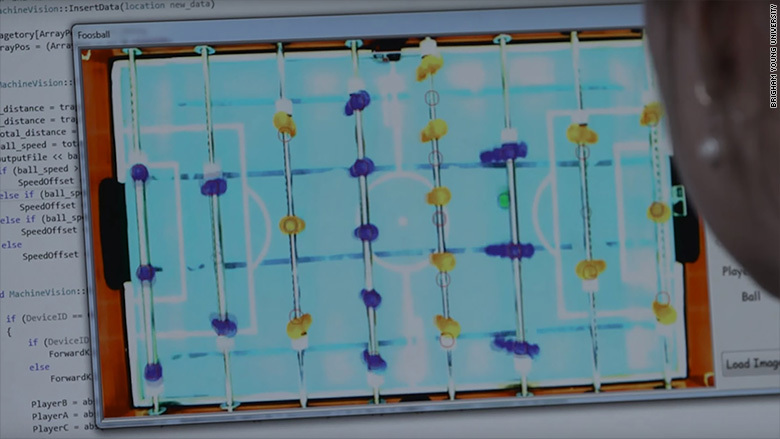 Programming software to play foosball is just another example of how nimble and adaptable computers and bots will have to be. Through the project, Warner and five other students learned how to control machines to do what humans can do, professor D.J. Lee told CNNMoney. Over the course of two and a half months, they played against different versions of the software program to figure out which one worked best. Then they invited a public audience of kids, older adults and other college students to play too. "The computer program won some and lost some," said Lee. "We're still working on it to improve it. But at this point it's as good as a human." Camera detects ball movement using color analysis. Lee's electrical and computer engineering students designed a program that uses a cheap web cam to see where a foosball is moving, then trigger the poles to kick the ball when it approaches. It's not a machine learning program because the students had to program strategies (when to play defense, when to play offense) into their code. But many times the AI reacts a lot faster than humans do. "We're actually struggling to keep up," Warner said. Autonomous foosball machines have been built before, but those models relied on clunkier motors that moved the sticks at much slower speeds or relied on predictive modeling of a ball's movement. The Brigham Young team relied only on the camera for a visual source of data to emulate how humans assess the game. Machine learning and AI technology allow computers to learn without specific instructions. They recognize patterns in data and draw inferences. Some scientists and technologists have warned that self-learning bots could be used for military purposes and lead to a dangerous arms race, or for commercial purposes and destroy jobs. But those who support the field say it can lead to big breakthroughs in problems like climate change. Applying AI to everyday activities like foosball illustrates just how varied AI design can be.